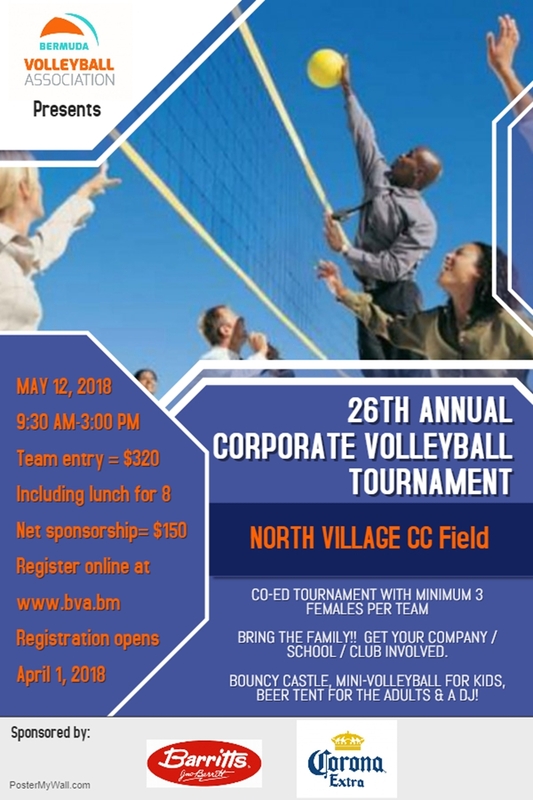 The Bermuda Volleyball Association [BVA] is getting set for its 26th annual Corporate Volleyball Tournament on Saturday, May 12th from 9.30am to 3.30am at North Village Community Club. A spokesperson said, “The Corporate Tournament is a recreational, co-ed fundraising tournament for players of all levels. This event is open to non-BVA members and is intended to introduce new people to the sport of volleyball as well as provide groups/companies with the opportunity to participate in a community event together. The Corporate Tournament is a family friendly event featuring a KidsZone with bouncy castle, kids mini-volleyball, food & beverage stalls. “How can your Company get involved? “Team registrations & net sponsorship registrations are to be completed online . Registration is open from April 1 through May 9, 2018. The rain date is Sunday, May 13, 2018. All registration fees must be submitted prior to the event. Following your on-line registration you will receive an invoice via email for payment.